Noreen Renier re-creates the method she used to lead Williston police to this water-filled limestone quarry, where they found the body of Norman Lewis, who had been missing for two years. WILLISTON - Police had run out of leads in their two-year search for Norman Lewis. They had done everything they could to locate the 76-year-old man who disappeared with his truck, but left everything else, including his wallet, behind in April 1994. The lack of leads was one reason why Investigator Brian Hewitt was willing to listen to a psychic's opinion on what might have happened. 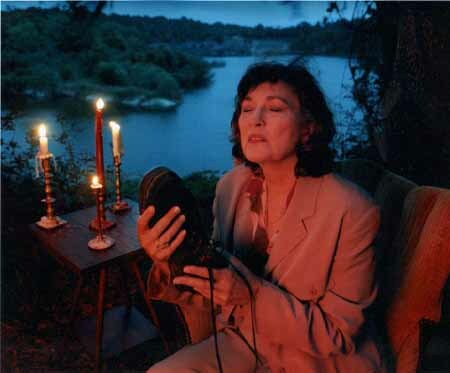 He was attending a police conference in Orlando when psychic Noreen Renier gave a demonstration. Hewitt realized police had no leads left to follow and mentioned Renier to the Lewis family. Figuring that police had done about all they could Joe Lewis paid Renier's $650 fee. In less than an hour, Renier - who had never been to Williston and was working from her Orlando home - told police she had a strong sense that Lewis would be found a few miles from his home in a water-filled area near railroad tracks. That information led divers to a lime rock pit outside Williston, but then-police Chief Olin Slaughter was puzzled because there were no railroad tracks visible. While divers were searching in the pit, nearby workers uncovered something else - an abandoned railroad track. Hours later, Lewis' body was found inside his truck at the bottom of the pit. "I don't think we ever would have found him (Lewis) without her help," Slaughter said. Using psychics is not something new for police, but it is often used as a last resort in cases that appear unsolvable, according to Professor Ron Akres, director of the University of Florida Center for Studies in Criminology and Law. "The track record for psychics is about chance," Akres said. "The stories that come out about psychics in police work are the successful ones. If you keep doing something over and over, eventually it will hit and that is what happens in those cases." Renier said one of the frustrating aspects of her work is calculating how often what she describes as her mental images of a victim or suspect are accurate. "Most of the time, the police will take what I give them and then I never hear anything again unless it's a big case like with Mr. Lewis," Renier said. Police are interested in knowing more about how psychics work. Renier has been invited to lecture at several departments in Florida, including the Sarasota Police Department, as well as at the FBI National Academy in Quantico, Virginia. However, no major research studies have been done on psychics assisting police. "That's because what they do is non-verifiable," Akres said. "You can never prove something doesn't exist, so then the question is what does it take to prove that psychic powers do exist? I'm not denying that some people may be psychic, but I wouldn't use one." Renier, 60, is unfazed by skeptics. She anticipated running into lots of them when she moved to Williston several months ago. Until last fall, Renier had never been to the Levy County community. The drive into town from Gainesville along State Road 121 is what convinced her to relocate. "It was just so beautiful and so peaceful," Renier said. Now living in a small, three-bedroom home off State Road 121 with her cats and two dogs, Renier has maintained a sense of humor about her unusual occupation. "I knew you would call. That's why I left the answering machine on," Renier's voice says on her answering machine. Renier has told a few of her close friends about her occupation but it is not something she uses to open conversations. "I understand the skeptics and I used to be one - everyone should have some skepticism," Renier said. "I used to think of psychics as someone with a big nose and a wart." The first psychic Renier met "didn't even have a pimple." 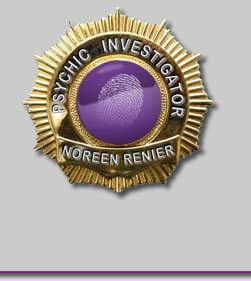 Renier was working at an Orlando hotel 20 years ago when that psychic rented a room for a demonstration. From that encounter, Renier said she began exploring her own mental abilities and discovered psychometry - picking up information from an inanimate object. Psychometry, she says, is what she used to determine where Lewis would be found. "I do no more than two police cases in a week because it is so intense," Renier said. Most of her work is done over the phone. While Renier gets the greatest satisfaction from her police work, she also does some work for individuals. 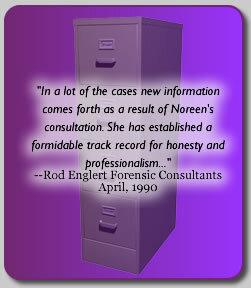 When Renier accepts a police case, she tells investigators to send her something that belonged to the victim. In Lewis' case, she had a piece of his clothing. She also allowed officers to videotape her as she focused her mind on determining where Lewis was likely to be found. With a glass of wine - to relax her - in one hand, and the clothing in the other hand, Renier told investigators where to look. "I've worked with police in 28 states and three foreign countries, so lots of it is over the phone," Renier said. "I usually try to meditate before I start and I'll burn some incense and have some wine to get in the mood." Renier will be teaching a non-credit class on Extra-Sensory Perception at Santa Fe Community College next month. What she would really like to teach is a specialized course for investigators. "My goal is to take a select group of officers and work on unsolved cases while teaching them how to do this," Renier said. "I think a lot of people have psychic abilities, but they just never take the time to develop them. This is really just a part of the mind like the logical, rationale part of the mind. We really can't explain how either part works."